A high-altitude balloon, that was launched by Google to provide high-speed Internet in the remote parts of the earth under "Project Loon", has crashed in a Kenya farm, a media report said on Saturday. The balloon, a part of a 10-balloon batch, was deployed for testing in Nakuru, Nanyuki, Nyeri, and Marsabit in July 2017. It crashed at Nthambiro in Meru on Friday night, media reported. Some residents complained of headaches after they gathered around the device to get its glimpse. 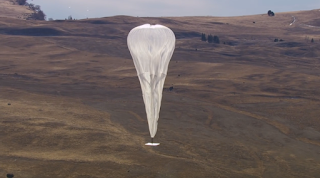 "The device from project loon indicates it fell after its expiry period of six months. No one is yet to claim the device," Igembe South OCPD Jane Nyakeruma was quoted as saying. Earlier this year, Google announced that it was "years closer" to deliver Internet to remote parts of the world using high-flying balloons. Researchers at Google's Project Loon -- part of the company's X research lab -- said it was now able to use machine learning to predict weather systems, meaning the firm has a greater control over where its balloons go, making it possible to focus on a specific region, rather than circumnavigating the globe, BBC reported. Under the project, the firm suspended a network of huge balloons that beam down connectivity.